These cute firm little “mini-apples” are a joy to play with to explore a new and different taste experience. The sweet, yet tart and sour flavour lends itself to go well as a garnish with many meat dishes such as roasted or grilled pork and chicken or game such as venison and pheasant. It is also versatile enough to prepare crabapple sauce with plain yogurt for a quick breakfast or snack time. I just tried this recipe for the first time, and it is amazing how sweet the crabapples become when roasted with the cinnamon. I placed them alongside my roast in the barbecue on indirect heat, covered in foil, and let them do their thing. This is a “must try”. And my grass-fed roast beef dinner was fabulous! Wash and dry crabapples, leaving stems on, spreading them out in a single layer on a rimmed baking sheet, drizzle them with a small bit of oil, dust them well with cinnamon, and roast them at 300 degrees F for an hour and a half until they’re soft and wrinkled. There’s no need for sugar, even though they are tart when they’re raw, although a drizzle of maple syrup would be special. Serve them warm or cold aside your favourite roast of chicken, beef, pork or duck. Wash crabapples. 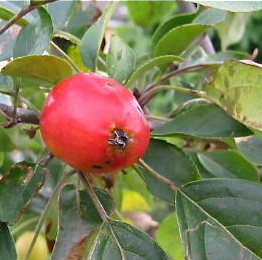 Cut in half and remove stem and blossom ends; do not peel or core. Place crabapples in a Dutch oven. Add 1/2 – 1 cup water to prevent scorching. Cover and place over medium heat and bring slowly to a boil. Reduce heat to low and simmer until crabapples are soft. Press through a food mill or sieve. Return applesauce to Dutch oven and bring to a boil over high heat, stirring constantly to prevent scorching. Reduce heat to medium and boil, uncovered, to desired consistency, stirring frequently. Add sugar to taste. Add cinnamon and nutmeg to taste. Return mixture to a boil, stirring constantly to prevent scorching for 2 minutes. Allow to cool. Serve cold or room temperature. Growing up in a rural area of Northern Ontario, we found crabapples on hand in the wild, spotted across the farmland, in fence-rows along side fields and pastures, or on an abandoned homestead down the road. One of my most favourite things to eat in the fall was Spiced Pickled Crabapples, with Thanksgiving dinner. I loved how sweet and cinnamon they were, and sometimes crunchy. It was fun eating the tiny kid-sized mini apples, and I must say when we could, those little tiny apples made great fodder in an apple orchard fight! Ouch! Mix sugar, vinegar and spices in a large pot and bring to a boil for 5 minutes. Carefully, add apples and reduce heat to simmer crabapples very gently for 2 – 3 minutes or until crabapples start to turn translucent. Be careful not to burst the fruit. Remove from heat. Let stand in syrup overnight. Pack cold into clean jars and fill to within 1/2-inch of top with syrup. Remove air bubbles with a narrow rubber spatula or plastic knife. Put on lids. Process in water bath at simmering temperature (180 degrees) for 20 minutes. This entry was posted in Uncategorized and tagged Sauces, Tasty Treats. Bookmark the permalink. We have tons of wild apples in our yard and the school yard next door. I’m not sure if they are “crab apples” per say but they are wild apples of some sort. We have picked at least 60 pounds so far and made apple sauce with all of them. Its been awesome!